/ Modified dec 15, 2016 2:13 p.m. Emergency blankets the city requested were sent to other cities hit by natural disasters. 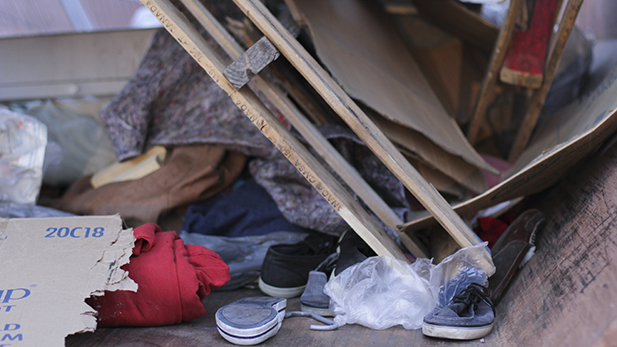 Clothing, wood scraps and blankets are pictured in a City of Tucson dumpster on Friday, March 13, 2015. The trash was from the deconstruction of the Safe Park protest in downtown Tucson. The city of Tucson is asking for donations of blankets and sleeping bags for the homeless. Officials ordered 10,000 blankets from the federal government to distribute to its homeless population, but those emergency blankets were diverted to other cities that have been hit by natural disasters in recent months. That means right now, Tucson has no blankets to give out when temperatures plunge at night, said Settle Madden, who works with the Tucson Pima Collaboration to End Homelessness. "Unsheltered homeless people will be much colder than usual," she said. "And there’s a possibility that there would be illnesses and possibly even death. So we want to do everything we can to make sure that doesn’t happen. " She said blankets of all kinds will be accepted and donations can be made at all City Ward Council offices and a few other sites, listed below. The goal is to collect 5,000 between now and Dec. 23. The following Tucson City Council Offices, 9 a.m. – 4 p.m. Monday through Friday. Sacred Heart Church, 601 W. Ft. Lowell Road, Monday through Friday, 9 a.m. – 5 p.m., enter west side of church property off Los Altos Avenue. Place blankets in corridor outside church. Contacts phone Jordan Francisco (520) 965-5795 and Carl Zawatsky (570) 406-5300. The Salvation Army Hospitality House, 1002 N. Main Avenue, Monday through Friday, 9 a.m. – 1 p.m.
La Frontera Center RAPP Team, 1101 E. Broadway Blvd., #130, Monday through Friday, 8 a.m. – 4 p.m.